New House, Live in Nanny and a Maid Anyone? I receive this magazine. 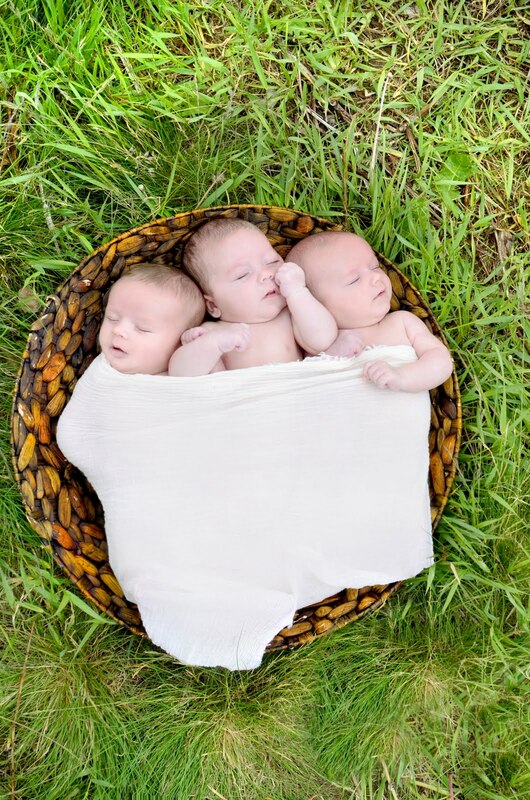 Triplet Connection. I read supportive stories about other triplet families that are just getting by with their live in nannies and maids. I read about how families had their in laws live with them for years, or how they sold their house and moved in with their family for help. 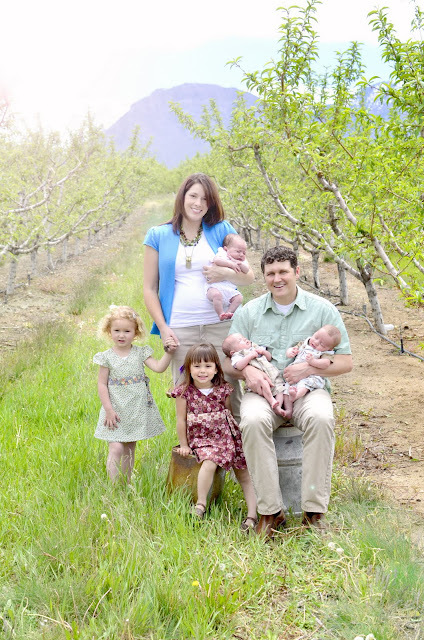 One family in particular, they had 3 year old twins and a set of newborn triplets. Sound familiar? They built a new house, had a live in nanny and family help all around them. They made bottles in the blender 12 bottles at a time and her maid did all the laundry. We talked about getting help. In the end, our house is too small and it would be a huge financial burden to pay for help. We are just a normal family, we mostly try to save what we have earned, although we are burning through $250 worth of formula each month. We don't have a new house or the latest and greatest whatevers, we chose not to. Sometimes we splurge, but mostly we are saving for rainy days, these are not them though, not yet. I don't know how we are doing what we do. N8s family lives in Boise and Washington (come back Stephen and Annie!). My parents live in Texas and my siblings live scattered about the country. Most of the time I feel like we are thriving! How can I feel this way? I fold laundry until 11 pm. Fall asleep. Get up and do it all again the next day. Yes, I freak out. Yes, I get tunnel vision. But it clears. The clouds clear, they always will. God has brought me this far and it won't last forever. This is the family he gave me and he knows we can take care of them, or he wouldn't have given them to us. I can ask for help when I need it. Here is what I know: I know God helps mothers, he has a vested interest in how my children turn out, he prompts and leads me through my day, I pray for him to, I cannot do what I do without him, he will not let me wreck them. I wrote before about how I pray for the wisdom to see problems afar off, well I also pray for patience, relief, ability to be kind and relax and for my children to forgive my sometimes ugly moments. I have to live by faith. I chose to live by faith. I love this life! Is that crazy?! I have never felt so happy or complete as when we found out it was triplets. I was like, 'Yah, that feels right." After I had the triplets and all the help died down, I was talking to a friend on the phone (worst past time ever, not a phone talker me.) she asked how I was doing and I told her we were fine. There was a pause and she said, "Okay, what are you on?" All I could say was, "I am running on faith" and then I laughed because I know how goody-goody it sounds. I give it my best everyday, because I love it, because I see some of the big picture and because I don't get a second try. Hazel and CC have found themselves in a considerable amount of trouble since the triplets have been born. Not really, I understand the need for them to explore, and I have actually never told them not to do the following things. In my defense, I didn't think I needed to but that is splitting hairs. They have made a slip 'n slide kitchen with water from the fridge door on the nice wood floor and had a blast, it is amazing how much of a mess they can make in such a short amount of time. They have washed the walls and windows with yogurt. Washed their hair in Vaseline, took me days to get out. They have brought cups of sand from the sandbox onto the carpet to play, they have colored on walls and ripped rooms apart more than I can count. I often hear myself saying the dumb things mothers say, you know, the things that make kids just zone out and totally ignore the next few lines you say. These ridiculous phrases are passed down through the generations, inspire no one to greatness, make no change what so ever and make no one feel happy. I will now recite the following conversation. Me: Did you make a mess in here? Me: Clean this up okay? Me: Nothing. Just get this cleaned up okay? Hazel: What were you going to say? The truth is Hazel would probably think it was totally cool to live in a pig sty. Even though she has never seen one. It is a stupid thing to say and totally pointless. I got to take my first shower since the surgery. I have been washing hair in the sink and scrubbing arms and legs with wet wash clothes for far too long. My wonderful mother in law is here working her fingers to the bone for my fine family. Her name is Grammy Pammy. As long as all my babies are taken care of I am happy. Hazel has been my big helper, she is so capable. She helps me change my bandages and talks to me about how this isn't that gross and "Mom? Remember the time when I was throwing up and throwing up and I couldn't stop?" Forget it, I will change my own bandages. I ran out of hospital bandages so I just started putting diapers over the drain sites. I've got plenty of diapers. I just saw tummy in the mirror. I think my belly button may be crooked. More on this later. I gotta show Nate first, the verdict is still out. I guess most women would still be in bed. The Dr was wondering if I was getting up and out of bed a little. Ummmm, yea. Was there ever any question? You told me I couldn't lift my kids, you didn't say I couldn't have them on my lap and feed them, read to little girls, wash counters, refill bottles, tidy up or go on walks. I feel like the triplets have given me a serious boost in my pain threshold. I haven't taken any painkillers. Even in the hospital I just asked for Ibuprofen. I can deal with the discomfort of having my muscles ripped apart while pregnant, I can deal with them getting sewn back together. It just feels like a tummy ache to me. Having celiac disease, I have had plenty of tummy aches. I do get a nap and I feel little or no pressure at all, Pam is wonderful with children, she had 7 kids and a daycare while N8 was growing up and she is here to prove she's still got it. Well, she does. We didn't have much privacy there. She would usually knock once and then enter. You did get fair warning though, you would hear her light step coming down the stairs. She was usually giving us some fruit or leftovers she didn't want. Once N8 and I were fooling around together and we heard her coming down the stairs. In a panic, we both hid our disheveled persons behind the curtain that was the closet. "N8, Sherry? Your car is here, you must be home." Door opens. Door shuts. N8 and Sherry think twice before they ever fool around while she is home. Some would speculate that is why it took us so long to have children. We lived there for 3 years. I love her and miss her. She told me once something that has helped me. From time to time, I struggle with depression and so did she. She said she knew how to get rid of it so I asked how. Sing out loud, serve someone or exercise, that's what she did. Wise words. When I pull myself together to do it, it usually works. Our family gets less colds than other families, I think we get only a fourth of whatever is going around the primary. I have a theory, and you doubters may think it is crazy. We use oils on Sundays before church. We come in contact with so many foreign germs with childrens' toys and hand shakes or hugs that I used to find we were fighting new colds every few weeks. Before we put on shoes or tights, I mix essential oils with a few drops of olive oil and rub their feet (the feet are great at absorbing oil), they love getting the time with me and getting their rub. I use anything- lemon, lavender, eucalyptus or I mix something special for each other them, it takes half a second. The reason I think this works, is they usually never get colds when I do it, when I forget to oil them, they usually get one. I don't sell the stuff, I buy it from my sister at Young Living or the Good Earth so this isn't a schmooze I just wanted to explain what worked for us. I visited the Dr today. He said I was healing up well, I should expect to wear a wrap for 6 more weeks as the swelling dies and muscles grow into each other. He also said that he cut 6 pounds of SKIN off my tummy. I just keep geeking out over it! Six pounds of SKIN ! Yuck. Yuck. Yuckk! The week I delivered Quinn, James and Wil, I was huge. I was a real show stopper. I had stopped going into public because I was so uncomfortable and I got so many stares and "oh mys! "Anyway, at 35 weeks pregnant, our toilet broke. It was about 10 pm at night and there was nothing doing until the next day. So I am going to the bathroom about 6 times a night at this point, and it is March. 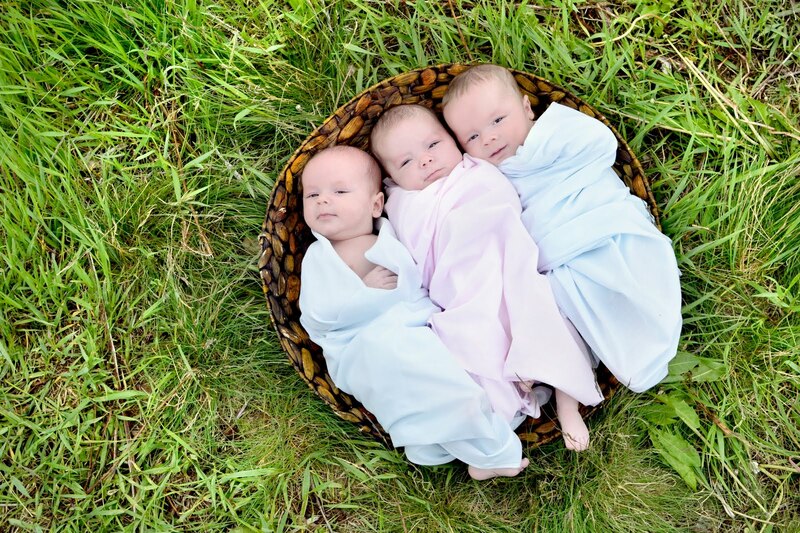 Imagine a woman 8 months along with triplets having to go in the bucket in the backyard. Can you think of anything more uncomfortable? That is my worst experience ever -I was already tapped out because of the pregnancy, although I was never on bed rest. I was done, I had had it! I think I actually prayed for some medical reason for the Drs to take the babies. Finally about 1am that night, I grabbed a key to N8s work and drove over there. Oh relief. On the way back, I drove past my friend Hannah's house. There she was sitting in a car with the boy her friends call "PB" counseling him about a failed romance. She jumped into my car and we took a lap around the neighborhood, it didn't seem so bad after that. It is like she was always in the right place to help people. Even from the MTC she sent her mother money to buy shoes for a sister in her district that didn't have the right footwear. Go ahead and Gawk all you Gawkers! The best advice my pediatrician ever gave me, except how to fix an out of socket elbow on a child, I have fixed it twice now on Hazel --loose ligaments, a tendency to play rough and fight back will do that to you. Anyway, the best advice he ever gave me was fight for naps. Hazel was starting to give them up, if she ever took them at all, her favorite past time is rip your room apart while you are supposed to be sleeping. I took the advice. We hold 1-3pm, or 1-4pm (if I am having a particularly rough day) sacred in our house and hardly ever miss it. The girls have a clock in their room, they know how to read the hour. I tell them when they can come out. "You can come out when it says 4 right here." They usually sleep about 50% of the time. But mostly I need that time. Juggling babies and toddlers and a home weighs on me. Of course they can go to the bathroom whenever, a privilege they totally abuse or they would have me believe that they have the world leakiest bladders from 1-3pm and after 7pm. In the morning, they can come out when the clock says 8, if they are changed and beds made, this maneuver helps me get the babies fed and myself showered before I get peppered to death with requests. I am a better enforcer somedays than other days, but I try to be firm. We try to get the girls in bed by 7 or 8 pm. We brush, read scripts, and pray or fight over who gets to pray and then get upset if we don't get picked, a problem I intend to rectify this week with a prayer chart. I know the critics out there think we put our kids to bed too much, but too much sleep never hurt any kid. N8 and I need that time to regroup, tidy and talk. Quinn and James are begging to be put to sleep around 7:30pm and usually make it 'til 5am. Wilson is a different cat. That boy sleeps about 3-5 hours less than the other babies. I call him Wilson the Watcher, he never wants to miss a thing. He doesn't mind sitting in a swing, or being carried around as long as he can watch the goings on until he falls asleep around 9 to 11pm. Wilson Lover of Chaos, for a rare moment sleeps. My friend Hannah used to come over and get Wilson, like he was some sort of novelty party favor. This baby that loves people and chatter and chaos and never cries as long as he is held. She would take him out to dinner with her friends and pass him around or to a friends house for a movie, then bring him home when he was asleep. Hannah left on her mission this week, seems like months ago, Wilson misses her, so do we all. When my mom first left after I had CC, Hazel was 5 months old, I was a mess. She left me with a love note, a vote of confidence and a challenge. Her challenge was to be showered, dressed and ready by noon everyday. I have done my best to follow that advice and it has made all the difference. Being a mom is my job. I chose it. I step up to it everyday. Everyday I feel like I am doing something special. I also feel like crud for somethings too! So I treat it like my work, I used to work as a business analyst for a company called Nu Skin. I loved it, it loved solving problems, completing projects, working with teammates, and learning new skills. Being a mom is similar, I miss the money, bonuses and people that talk in a calm, direct manor but nonetheless I treat this like a job. Everyday, I chose to be awake, to shower is my privilege. It is okay that a baby cries for a few minutes so I can take a shower, but I can count on one hand how many times that has happened in the last few months, now that the babes are down to a routine. Unless it is a Saturday and I have deep, dirty tasks to undertake, the day does not start until I have had a shower. I work at solving problems and I pray for wisdom to see problems afar off. I ask the Father for answers, what can I do to help CC overcome her fears? I invite CC to talk to people, I bring her to people she knows at church, so she can say Hi to them, I coach her in looking into their eyes and smiling, not looking away. I have special bike riding dates with her, I hold her close. I think about problems, how can I make everyones contributions feel valuable when they are so competitive and so different? I praise what they can do personally, Hazel will take on all three crying babies at the same time, trying to entertain them. Once, while I was in the backyard, she made a bottle all by herself, climbed in the crib with Jamie and started feeding him, that girl will take on the world and she won't back down. CC helps me bathe the babies in the big sink Tuesdays, Thursday and Saturdays. She throws their dirty clothes downstairs, throws wet diapers away and after I soap the babies, she climbs up on a stool, rinses them with a cup and sings to them. She loves to put away the silverware from the dishwasher and I hear her telling herself, "the spoon sleeps here, and fork lives here." Both girls bring me diapers, wipes and onesies when asked. 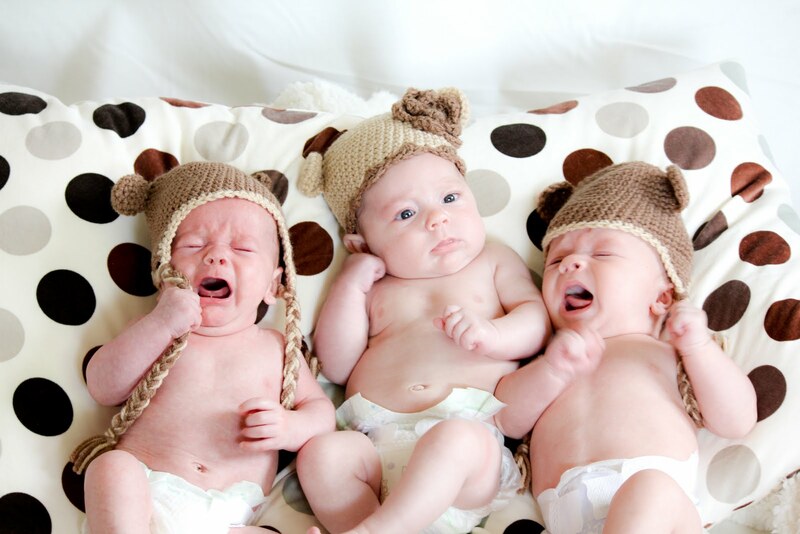 They are especially fond of picking the babies outfits. The next time my mom left, I had just had Quinn, James and Wil. This was her challenge: Know what you are going to make for dinner by 10am, then you can do little things throughout the day to work up to it, thaw chicken, mix dressing. I have celiac disease. I can't eat wheat at all. I make everything from scratch, I have to, pretty much everything has wheat in it. I love these challenges. I have struggled with this last one, when I keep it, the day runs better. I also feel like a million bucks when N8 gets home and I have something tangible to show for myself. Thank you mother. What Did You Get CC? Hazel is a great colorer. For her age she shows great use of color choice, fills out the pictures well and uses bold strokes. Grammy Pammy took the girls to Jumping Jacks. There was a coloring contest, Hazel really took her time and did a great job. She ended up winning! When we went to pick up the prize they told us that CC got a prize too. Hazel got a great big basket filled with toys and candy. CC got an Easter egg. I had to stop myself from running down to Walmart and making it even. I knew at this time CC had to "drink her bitter cup". I think it is part of life learning. I can't make everything even for those two, because they are so different. But I do try to be fair. I come down harder on Hazel because she is more contentious and defiant. CC probably doesn't get in as much trouble as Hazel, but I suit my parenting to each girl. My problem with CC is she just silently wanders away. If I ask the girls to clean their rooms, Hazel will stand and confront me- she usually gets in trouble for yelling, CC just wanders away, not as punishable, but the room still needs to get cleaned. The beauty of Hazel though, is if she is committed to a cause she will get it done, period. Anyway, back to CC drinking her bitter cup. On the way out to the car, I report hearing the following conversation. Hazel: Hey, Cease (her nickname for CC as though you can get it any shorter.) what did you get? Hazel: Sweet can I have one? Gives Hazel one of her egg candies. What a gal that CC. She has amazing qualities much like N8. My close neighbor Amanda (http://www.mrnemelka.blogspot.com/) will testify that Nathan amazes us constantly by his mild and kind ways, his whole family is like that. I can count on one hand the times I have seen Nathan blow up about something (besides BYU Football). How many other dads, as involved as he, is can say that? Oh, and he loves to clean. CC is like him mild and delightful. Unfortunately, Hazel and I go head to head more often than I would like. But I know if I can keep it together, and we can all forgive each others ugliness from time to time, we will all be real best friends. I am raising my future best friends. They are my friends now, but my roll is more of a parent. Someday, I believe it will change to friend and mentor. Glorious. I have so much to tell you. Once I decided to write a blog I have thought of a thousand things to tell. 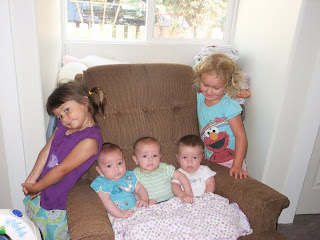 I am the mother of Hazel and CC (Claire Christine), Quinn, James and Wilson (baby triplets). We have the best life, but it is quite tense sometimes. It took Nathan and I while to have children, 7 years. Then we had them in clusters or heats. It is as though all those children were up in heaven saying, "no, don't send me don't send me, not to her! I will only go if you send me down with them." So Hazel was my first. She is my champion and best buddy. Her birth mother Momma Jessica is our heroine and our friend. She gave us a daughter that is so much like me sometimes I wonder she didn't come out of me and CC out of her. Hazel is brave, energetic, super capable, silly and wild. CC is the same age. She and Hazel are opposites. I often don't give her the credit she deserves because her talents are not as visible. She isn't a daredevil, but she naturally sweet and kind, patient, generous and loving. She gives me confidence and shows love easily. Both girls are amazing singers. At 2years old they could sing the first verse and chorus to "America the Beautiful", and "Master the Tempest is Raging" (I thought it would help with Hazels temper) and they recently added "Farmer Tan", "Have I Done Any Good in the World Today?" and "On Top of Spaghetti" to their repertoire. I don't push them to sing, but I sing all the time and they pick it up. They both love learning. 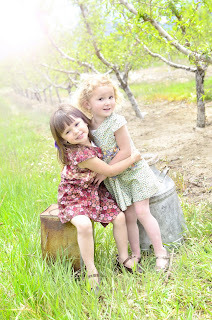 Special thanks to Rachelle Olmos www.lareephotography.com for the above photo. I love it, that is about what is is like around here. She did a great job capturing cuteness. Quinn is just wondering what everyone is so upset about. She is pretty calm and happy. My mom would call her a floor baby. Just happy to play and be on her own. My neglect has paid off, both Hazel and CC have always loved to swing. I used to get swing elbow (like tennis elbow, very crippling!) When I had the triplets, I couldn't swing them anymore. So they both learned how to swing by themselves. My great accomplishment this summer is helping a very hesitant CC learn to ride her bike (with training wheels). I can tell you all about the triplets, but that can wait. Their little personalities are still developing so more for another day. Needless to say Quinn is the girl, she was born 6.10lbs, James was next at 5.10lbs, Wilson was last at 5.3lbs. I am so proud of them my buttons are bursting. Someday I would like to tell you what a normal day is like for us. So from left to right, Hazel, Quinn, Wilson, James and CC. Well, I have seem my tummy. There is no 6-pack. Disappointing? A little. Here is what happened in the surgery. I was asked to put on disposable shorts (cool!) and a hospital gown. The the Dr pulled up my gown exposing my tummy. He drew a line from hip to hip. Then he made 2 more lines to form a triangle a few inches above my belly button. He was going to make all those cuts and he would cut out my belly button and set it aside. He would sew my errant stomach muscles back together, pinch all the skin from the triangle, cut it off and sew it together. For the final touch he sewed my belly button back in place so that I would have the appearance of a belly button should I ever choose to wear a bikini. But I have looked at it, and it is way smaller than my old button used to be (pre-triplets). He also said he would do a little but of liposuction on the sides to even things out. Ladies, I am pretty sure no one has compassion on the woman that just had free lipo, but let me tell you, it hurts. I have bruises up my back and ache like I have been hit by a truck. I can't lift anything more than a gallon of milk for 2 weeks. So I can lift half of a Wilson, who is going to lift the other half? So here is a before, note my protruding button and tummy. I am sitting in my hospital bed. Having had a huge stomach surgery. I always swell up like a balloon with the saline drips. I just sit there and watch the drip thinking no, no how much more of this do I need? All in all, I am doing well. I still don't know what my tummy looks like it is heavily bandaged. For those of you who don't know, I gave birth to 17.8 pounds of babies back in March and it took it's toll on my person. If you never thought I looked that far along (5 months along with a belly button sticking out) you probably saw me with wrap or something I wore on Sunday called the miracle suit. www.shapewear.com Totally saved me from having to buy all new clothes. It doesn't matter how chubby you are (and I have had my share of chubby), but if you have smooth lines in your silhouette no matter how big you are it makes all the difference. N8 is coming soon, the nurse will teach us how to empty the drains, then N8 can take me home. Home! With my wonderful family and wonderful mother in law. I will post non-graphic pictures when the swelling dies down. I think everyone loves a good before and after shot. I don't swear, I never have and I have my parents to thank. I remember being profoundly repulsed by a kid on the playground that swore at me in elementary school. I swore once, when walking home from elementary school- my sisters friend was giving me spelling words and I was saying them out loud as she spelled them. It is amazing to see how ugly a persons face becomes when they swear, even if I consider that person to be beautiful. I am not perfect, and I know I can make other words that are just as ugly and cutting (but more clever) as swearing, however I think that what we say and what we think over time, becomes engraved in our faces and on our hearts. When we get to heaven, we shouldn't have to change who we are to be with God. We should be ready made friends with Him, and it can take some of us a lifetime to become that way, but we will get there. I think because I posted this, I should probably expect to be tested about this sometime this week. So How Humble Do I Need To Be? It is a source of unending pride that we pulled off this house painting job with 4 month old triplets in our hands. I couldn't have done it without N8. I am the painter in our home. So I got the house painting gig and he got the take care of kids job. I wonder who got the better end of the stick? Here is a picture of our house a few Christmases ago- only one I could find. Before and after shots, you gotta love 'em. Oh and by the way, that awesome bush sort of blocking our walkway- with the orange flowers on it, is seeding. Come grab some, they are the ultimate "lil' girls flower picking plant". I put it in the wrong place, not knowing how tall it would grow, but it is lovely. Come over, get some seeds for next year. I planted them in the spring of 2011, and the girls have brought me joy in a little water cup with those orange flowers littering our kitchen counters for months. The other flowers are Jupiters Beard (pink), Sundial (red) and some wild flowers all of which we planted in the spring. I plant my flowers so my girls can pick them.